Books are very important in our house. Not only because I’m a teacher, but because JL and I both recall reading a lot when we were children. Then one day I saw a commercial for a show called George and Martha. I was curious, could it be THE George and Martha that I loved when I was a child? Sure enough it was a show with Nathan Lane as the voice of George based on the books by George Marshall. When I was a kid, we all used to fight in my elementary school to take out these books. I once again programmed the DVR to record these shows for NHL to enjoy. We all loved them. They were adorable and made the books come alive. During a rainstorm last Saturday we decided to head to the bookstore to use up a gift card that NHL had received. We went in and saw a few books. 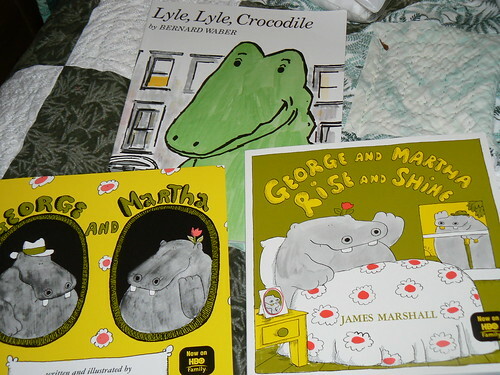 Then I suggested looking for a Lyle the Crocodile book and possibly George and Martha as well. Here’s a photo of the books NHL picked out. Since we bought these they have traveled all over in his backpack. He loves them and wants us to read them to him all of the time. It’s so nice when some books are timeless and can be shared with your children. How sweet! We have a million but I dont read as much as I should! I am going to get on that now that its time to order more books! I cannot wait until they can read some of the favorites we had in Elementary school. I loved the B is for Betsy books. I wonder if those stories are still around. Sandra: We actually bough NHL a bookshelf to put all of the books that he has and that I had from my collection that he has inherited. That is the NHL library. He’s allowed to take 2-3 books out of his library at a time, but must put things back before taking more. We had to do this since NHL is a book hog and would take tons of them and leave them all over. This has worked really well. The funny thing – he has a fake credit card that he uses as his library card to take them out! Hopefully J’s school will have Scholastic Book orders for you to do. They are the best. They have perks for teachers when students order books (makes nice classroom libraries), plus the books are SO cheap for us. Next time I get an e-mail from Scholastic I will let you know. They have warehouse open houses that are amazing. We went to one out west by my brother last year and even JL was going nuts.